This preowned Martin Logan Motion 8 center channel has been gently used and is in great condition both cosmetically and functionally. 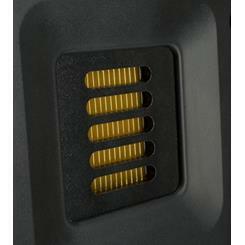 It will come in the original packaging and include the OEM provided speaker mount. This speaker sounds absolutely fantastic and excels in the Midrange and clear transparent highs due to Martin Logan's Folded Motion Tweeter, which is also found in the much higher priced electrostats. Please let us know if you have any questions or special shipping requests prior to purchase. Thank you for shopping with Arkansas Premier AV. The south's premier provider of quality preowned Audio, Video, and Home Theater equipment. The Motion 8 uses MartinLogan's acclaimed Folded Motion tweeter for smooth, effortless highs. MartinLogan's elegant Motion 8 was designed for maximum performance and flexibility. 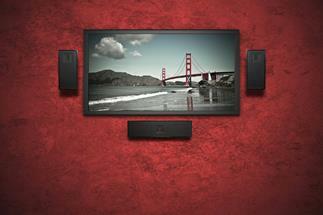 This versatile speaker comes with brackets for easy wall-mounting. And because you can orient it horizontally or vertically, it makes a great center channel companion to other wall-mountable members of the Motion series, such as the Motion 2 or Motion 4. You can also use a trio of these speakers across your front left, center, and right channels for a seamless front soundstage. The distinctive sound of the Motion series starts with MartinLogan's Folded Motion tweeter. Rather than a dome or cone driver, this tweeter uses a pleated diaphragm that works like an accordion by "squeezing" air to create sound. It requires about 90% less excursion than a typical 1" dome tweeter, resulting in quicker response time and much lower distortion. The tweeter's controlled sound dispersion creates a focused soundstage with a real sense of presence. Music and movie soundtracks sound amazingly detailed, but smooth and effortless, without a trace of harshness. The tweeter is flanked by two 4" doped paper cone woofers that supply accurate mids and bass. All three drivers are mounted in an eye-catching curved cabinet that's finished in classic high-gloss piano black. The Motion 8's subtle, modern lines complement just about any décor. For even better bass — and especially for high-impact home theater — we recommend a powered subwoofer, like one of MartinLogan's excellent models. *The specifications provided above are for reference purposes only. Arkansas Premier AV does not independently test manufacturer performance claims and therefor is unable to guarantee their accuracy. The specifications provided above were obtained through a simple online data search and pulled from Crutchfield online. The information may be subject to errors, omissions, and or copyrights. We suggest contacting the manufacturers directly for any applications that require a higher degree of accuracy from the performance specifications.